Oh, how I love vacations! I have been extremely blessed over the past few years to be able to take my little family on vacation. This year, we decided to go early in the Spring instead of summer when it's so hot. Which worked out fine. We did a ton of walking in Atlanta because the weather was so nice. Things didn't start cooling down and raining until the last day in Pensacola. This is the first time I have ever went on vacation and really TRIED to stick to a strict plan of eating. At times, I feel like I started obsessing. At times, it really stressed me out. But overall, I think I did ok. The first night I had soul food from a famous place in Atlanta (Mary Mac's Tea Room). The next day I picked at Chinese food (but it was horrible and not worth it). The third day we at dinner at a buffet in Tallahassee and I tried to choose lean meat and lots of veggies. But the last full day (in Pensacola) was where things went downhill. I was able to cook breakfast at my sis-in-law's that morning, and between the drive to Pensacola and the beach and shopping, it was 9:30 p.m. before we had dinner. Other than a few snacks while driving to the beach early in the day, I hadn't eat. So I was hungry. And tired. And cranky. And my kids were on my nerves. So I ordered a chicken pot pie and sweet potato fries from O'Charley's. And I convinced myself that it was the last night of vacation and I deserved it. And I enjoyed it SO much. But the next morning I got up and at the leftovers for breakfast. And then proceeded to eat two blueberry muffins from the hotel's continental breakfast bar... Don't even ask me why I did that. I don't know why I lost my sanity. Muffins???? Where in the hell are they on my plan? What did this mean? Am I off the wagon? Am I out of control? Will I be able to get control back? Oh, God... please help me. I can not fail this time. I HAVE to get back on track. So after the 7-hour drive home, the kids were chillin' and I read on Facebook that a good friend of mine was at our local Chili's having a 'rita. So I decided to join her. Because a margarita could only make this day better, right? How could it be? I'm back down to my lowest weight from the beginning of March. The four pound gain that I've been stuck with is gone. 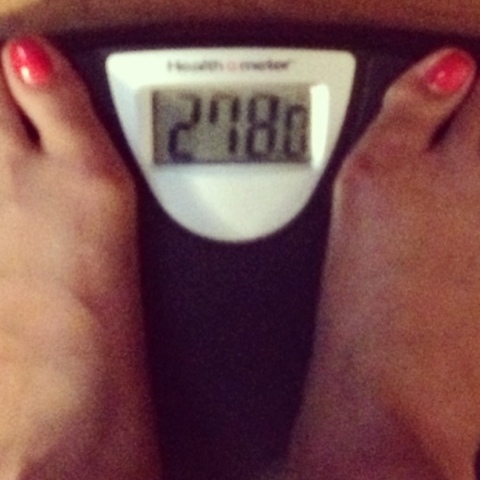 I stepped on the scale about 20 times... even moved it to different places around my room. 278 to 279.4 was the number each time. I've been stuck at 282. Soooo, that was definitely motivating. Today, I have eaten clean and drank a ton of water. My plan is to stick to fish and veggies for lunch and dinner this week, and eggs/protein powder/veggies for breakfast. Five days straight. As a sort of detox. Because on Good Friday I'm hitting the road again for Missouri for Easter. And it's going to be lots of food temptation, as well as emotional stuff going on because I'll be seeing my mother. With Alzheimer's I never know what to expect, but either way it's so emotionally draining. I'll have a plan for my food before I leave town, and it should be easy since I'll be staying with my sister and we mostly eat in. I'll figure it out. So here's to a great day back on track! Tomorrow I'll be back at the gym and I'm SO excited! It's best not to stress and just remember that you are in control and that you can get back on track. Maybe your body needed a change in order for you to lost that extra big? You never know. Scales and weight can be mysterious things sometimes. Anyway, glad you are back in control. Good luck this weekend! That is awesome Hollie! I do that same shame spiral. Maybe your body was in starvation mode and you needed the extra calories to get the scale moving again. I'm glad your body and your own weight loss got you back on track! I know those days. But a nutritionist I talked to a while ago told me it's a good idea to have those days as part of your plan. No, I'm not kidding. Those days can be booster days for you. Your body gets back into the feeling of getting lots of food again and starts the burning engine to run on top gear. And it will for a few days. So if you have just one day from time to time you'll get a boost in burning calories. Just starting the journey myself. It's great to know I'm not in it alone! Cool and creative inspiration, thanks! Glad to hear that you've got your motivation back! Sometimes falling off track is the best thing you can do to remind yourself of what you're doing and why. I'm glad to hear your vacation was enjoyable. I could totally feel that panic though, when you said that you felt you we're slding out of control! I've had those moments and days too. And it's feels like an out of body experience. You know the food is bad for you, you know what you need to be eating for clean eating, and yet you just can't stop! I'm so glad that meeting up with your friend was just what you needed to get your head back in the game. Woohoo! I find a low carb diet works for me and lots of walking. Hollie that is great!!! Congrats on the loss and lucky you going on vacation!!! Glad you enjoyed it! Great blog! I love reading about how much success you and others have had losing weight. I just started losing weight myself, I actually lost 23 pounds in 2 months. It's the perfect weight loss program for those who want to Lose Weight Fast. Glad it all worked out and you are back on track. We missed each other in Atlanta and Pensacola by a week. I was there about a week before you visiting my daughter in Atlanta before going to my 50th HS reunion in Pensacola the weekend before you were there. I still keep track of your efforts and still applaud how hard you have worked while I have been watching. Keep it up. Still proud of you and have a link to your blog on my blog at http://fitness-after-40.ws. Your efforts are a constant inspiration to all who are struggling to stay healthy and keep their weight under control. Great! I had never heard about this thing before. Thanks for sharing such a nice information with us. grat job very nice post about weight loss program. You're such an inspiration! Keep up the great work!